This bright red pin badge is a little sassy. You could let someone know they're Hot Stuff. 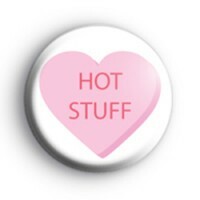 or we think this is a fun badge for the Bride or Groom to wear on their Stag/Hen Party just as a bit of a joke.